The back is made up of thoracic vertebrae and lumbar vertebrae. The thoracic vertebrae have more range of motion between them than the lumbar vertebrae. Indeed, the lumbar vertebrae are all but fused in the adult horse to help add stability and strength to that section of the back, which is the weakest and most susceptible because it’s a freespan having no ribs to support it. Youngsters show more flexibility and ability to ‘twist’ than an adult because their vertebrae aren’t done growing and ‘setting’. Think of it like a baby’s skull that is soft and still in ‘pieces’ and then as the baby grows and matures the skull hardens and fuses. This is just one of the many reasons why riding young horses can be detrimental to future soundness and it’s also a main reason why so many racehorses hurt their backs, but that’s a topic for another day. If a horse has a medium length of back, but a loin that is proportionately long, then that horse will have less lateral flexibility than a horse with the same medium length of back, but with a loin that is proportionately shorter. Let me phrase it another way: the longer the loin proportionately, the longer the freespan of relatively immobile vertebrae, therefore, the less lateral back flexibility. So now we want to take a closer look at our six horse’s backs and determine how much potential flexibility they possess. First we want to see how far the ribcage carries back. (I’m saving the loin for our final part of the series.) The further the ribcage carries back, the more strength it adds to the back (similar to withers that carry back well), AND the more potential for lateral flexibility because that means the more thoracic vertebrae length we have proportionately. There are two methods for determining how well the ribcage carries back; one is a ‘quick and dirty’ method and one is our trusty measure and calculate method. We’ll start with the latter. A horse with the maximum potential for lateral flexibility (which, btw, is the ability to perform a volte or 6m circle) will possess a ribcage that exceeds 100% of its back length. A horse that possesses an average potential for lateral flexibility will possess a ribcage close to 100% of its back length. A horse that possesses a below average potential for lateral flexibility will have a ribcage well below 100% of its back length. Remember, though, that all other things would have to be equal. For instance, a horse with a medium back that had a ribcage of 95% would have less lateral flexibility potential than a horse with the same medium back length that had a ribcage of 110%. 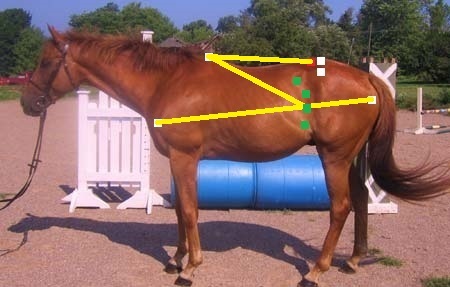 BUT, a horse with a medium back that had a ribcage of 110% would have more lateral flexibility potential than a horse with a short back and a ribcage of 110% because the medium back possesses more thoracic length to start with than the short back regardless of having the same ribcage length. Still with me? To determine the ribcage length we start by measuring back length (highest point of wither to LS joint). Then we draw a body length line (point of shoulder to point of buttock) and a second line from highest point of wither to the last rib. Where that second line intersects the body length line is the end point of our ribcage. We then divide the ribcage length by the back length to get our ribcage percentage. So, you’re staring at our first horse and maybe wondering where is that last rib? This is another point on a horse that can sometimes be hard to identify in a photo. It is always best to look at a horse in real life, make a guess, and then palpate to determine how close you were. Over time your eye develops and you start to be able to pick up the nuances of muscle, skin, shading and lighting that can indicate, not just in real life, but also in a photo where such a point is. Without even measuring we can see that the ribcage line is almost as long as the back line. My measurement is about 97%, so that’s a ribcage that carries back well, adding strength and flexibility to the back. But remember, this horse had a short back, so even though the ribcage length is very good, that overall shortness does bite into potential lateral flexibility. This horse doesn’t have the same muscle definition as our first, so judging where the last rib resides is more difficult. Here’s another one where we can see the ribcage line is very close in length to the back line. This horse measures almost 95.5%, so close to horse #1. This horse also had a rather short back (just a touch longer than horse #1), so we can conclude that both horses are likely to have similar lateral flexibility potential. The sun helps a little bit here to locate that last rib. This horse’s ribcage measures pretty much right on 100%, so carries back well and with a good amount of lateral flexibility potential. This horse also measured at the longer end of the medium spectrum, so there’s even more potential for flexibility. 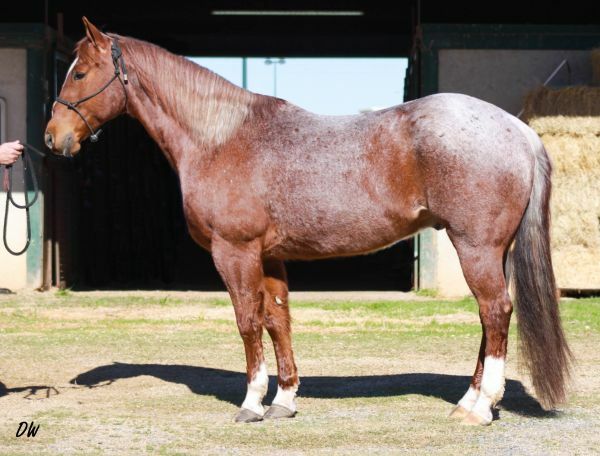 Another horse with a ribcage that carries back well at 95%, but with a back length that falls on the short side. How does this horse’s ribcage measure up to the previous ones? If you guessed that this horse’s ribcage carried back the furthest, then good eye! Finally, we have a horse with an exceptional ribcage at 104%. Our TB and our grey QH had similar back lengths, being at the higher end of medium in range, but our TB has a ribcage that carries back further, so should possess a bit more lateral flexibility potential. Indeed, this horse should have the most potential of any of the other horses in that area. And lastly, remember that the further the ribcage carries back, the more strength it adds as well. How far back does this horse’s ribcage carry? Our poor Paint mare takes another hit with a ribcage that carries the least distance back at just under 91%. She also possessed our longest back of the group right at 50%. So here is a situation where longer is NOT more flexible. Now that you’ve got the hang on the measuring method, I’ll tell you about the ‘quick and dirty’ method. Place your hand between your horse’s last rib and point of hip. More than a ‘spread’ hand’s width (8”) is a ribcage that doesn’t carry back very far. A ‘spread’ hand’s width is a ribcage that carries back well, and less than a ‘spread’ hand’s width is a ribcage that carries back very well. You cannot have a ribcage carry too far back. The further back it goes, the better. The rider sits on the horse’s back and is carried forward. But the horse’s back is not designed to carry weight, and that is why so many horses travel with their backs hollow and tense. This is where I tell you to read a certain one hundred page book on skeletal, ligamental and muscular anatomy, center of gravity, the ‘ring of muscles’, how the horse must be ridden to counter this physical weakness, why it so often goes wrong, blah, blah, blah. The truth is if everyone knew that we wouldn’t be ‘here’ talking about something as simple as back length. Someday we’ll tackle that topic, but not today. For now it’s good enough to know that a long back in a horse is a fault. It lacks longitudinal strength and often sags under the weight of a rider, creating a ‘leg mover’ that certainly can give a smoother ride, but only at the expense of the horse. Prime examples of leg movers are gaited horses that tense and hollow their backs to be able to move their legs in any number of timed sequences, as opposed to your ‘back mover’, the Dressage horse, that swings freely through the loin and back. This latter requires a rider to have a supple lower back that follows and absorbs this movement to prevent being launched out of the saddle. Additionally on the subject of longitudinal strength; without it the horse cannot easily maintain engagement. A long backed horse often presents the rider with the additional challenge of trying to keep the horse straight from dock to poll. Don’t, however, confuse that with lateral flexibility. Indeed, a shorter backed horse is often more laterally flexible than its long-backed counterpart. I will address that in an additional article (2b) in this series. An excessively short back is also a fault in a horse. Such a configuration doesn’t allow for enough room for a saddle to be placed, as well, sets the rider’s weight on the loin rather than on the ribcage. It’s never a good idea to ride a horse from its loin; the weakest portion of an already weak structure. 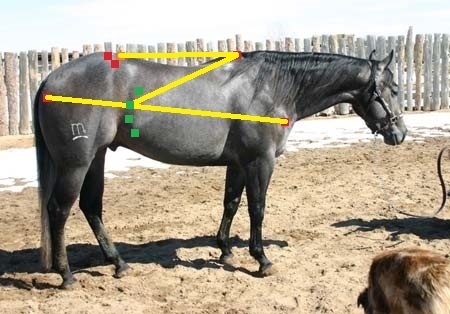 To determine back length we measure the horse’s body length and divide that number into the back length number to arrive at a percentage. Body length is measured from point of shoulder to point of buttock. Back length is measured from highest point of wither to lumbo-sacral joint. Here is our trusty skeleton horse with the points marked in red. The highest point of wither is usually thoracic vertebrae four (T4) and the lumbo-sacral (LS) joint is located between lumbar vertebrae six (L6) and sacral vertebrae one (S1). I’ve added an extra dot marking the highest point of croup (sacral tuber – top point of the pelvic bone) to help establish the location of the LS joint since it can’t actually be ‘seen’ in a photo; residing 2-4 inches below the surface of the skin. The best way to locate the LS joint on a horse is to palpate the horse’s back. As you move along the length of the back you can feel the individual spines of the vertebrae, then you’ll hit a ‘mushy’ spot and finally vertebrae spines again. Below that ‘mushy’ spot is the LS joint. For article purposes, we’ll use the highest point of croup (which is located behind the LS joint) to help us find the LS joint in photographs. The LS joint is the most important trait to discuss in horses in terms of athletic potential and movement. The entire hindquarter of the horse pivots on this joint and its location relative to the horse’s point of hip is instrumental to a horse’s ability to engage and collect. I’ve added more dots to our six candidates and it’s time to measure back lengths. 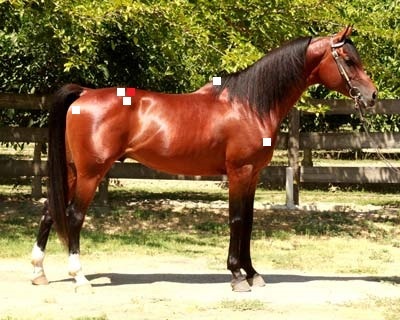 The LS joint is marked in a different color and though I’ve placed that mark at the skin level of the horse for measuring sake, remember that it resides 2-4 inches below the skin surface. Take a look at him unmarked. Where do you see the points and how does his back length look to your eye? Imagining a saddle on the horse and seeing how much space between the back of it and the start of the hip is sometimes helpful. If there’s a lot of room, chances are the back is long. If no room, then the back is likely short. This horse has a back length of approximately 41.5%. That falls clearly in the short back range, giving this horse a high degree of longitudinal strength. Did you imagine a Western saddle on him and where the skirt might come to? How does this horse’s back length compare? Does it look longer or shorter? This one measures almost 42.5%, so a full percentile longer but still falling in the short range and possessing a high degree of longitudinal strength. Start to take notice of the relationship of the highest point of croup, point of hip and LS joint, and how they differ for every horse. Like the first time around, when it was difficult to spot his point of shoulder, it’s equally as difficult to spot this horse’s highest point of wither. He has lower withers in general, which is not a fault and different than ‘mutton’ withers, which is a serious fault in the horse. How does his back length look? If you thought this one looked longer than the first two, then you get a gold star. This horse is approximately 48% falling in the medium back length category. Here we see a set of prominent withers. In this case they are also ‘camel withers’. Though difficult to detect because of the mane and photo background, look closely. Follow the top line of the mane and you’ll see a significant dip in front of the wither and then the wither drops off abruptly. A dip in front of the withers can indicate a few different things, so not all horses with a dip there (and an abrupt ending) have camel withers. 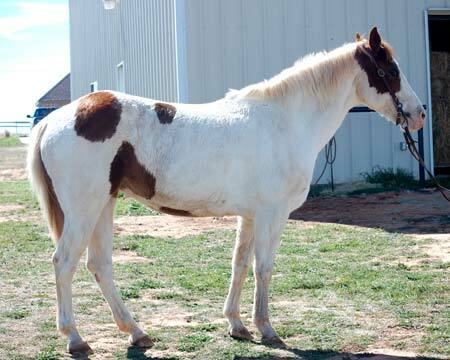 Let’s compare horse #2, our roan QH. 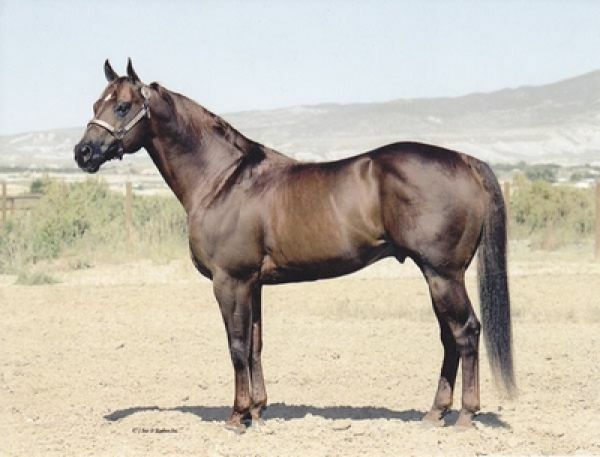 The dip in front of his withers is easily gotten rid of with good riding and training, which would significantly change his neck musculature and fill in that dip. Our Arabian stallion, though, already has way better neck musculature (mostly because it’s a stallion’s way to arch and telescope their neck to get the chicks) and still a big dip. There is no amount of correct riding or training that will get rid of it. Camel withers do not function as well as better constructed withers; that as a ‘fulcrum’. Scroll back to the skeleton horse for a moment and look at the ‘spines of the wither vertebrae’ that make up the withers. Those spines vary in length for every horse. Thoroughbreds generally have very long spines compared to Quarter Horses. Back to our Arabian stallion; how does his back look? He too falls into the short back category at almost 43.5%. Now that you’ve seen three short backs and one medium, has your eye gotten good enough to guess where this horse’s back length falls? The mane and the background of this photo make it hard to see that highest point of wither. If you guessed the longest back of all so far, but still falling in the medium range at 49%, then you were right. What is most significant, though, is the placement of the LS joint. Remember this horse had the shortest pelvic length of the group, representing the least power potential by falling in the poor category. 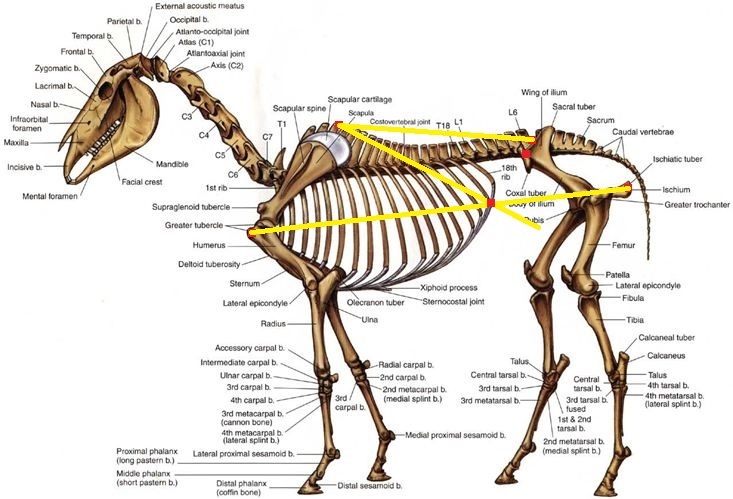 But I also said the horse had two ‘saving graces’, one of them being exceptional location of the LS joint, and earlier in this article I stated that the LS joint was the most important trait to discuss when talking about athletic potential and movement . Here we clearly see that the LS joint is located the furthest in front of the point of hip of any horse thus far. That is most advantageous for ANY horse, ‘adding’ length to the hip and thus power potential. In this case that poor length of hip is moved into the adequate/average category. Is it then possible that the LS joint placed ‘behind’ the point of hip (such as seen with our roan QH) might ‘subtract’ length and thus power potential from the hip? (Rhetorical question) Additionally and even more importantly, an LS joint placed in front of the point of hip makes engagement, as a whole, easier to achieve. Last chance to test your eye on the horse with the hardest point of wither to identify. I’m not entirely convinced I’ve got it right. As it’s marked this horse falls long with a back of 50%. If I’m off at all, it’s a touch to the long side, but either way we’re looking at a back as long as we ever want to see on a horse, and we’d really prefer it to be shorter. There is one more thing I’d like to point out concerning back strength. The further withers carry into the back, and the gentler they taper off into the back, the more strength they add to a back. Of this group, our TB has the nicest set of withers that gently taper off the greatest distance into the back, adding strength. It’s time now to go out into your barn and palpate your horses’ backs and find the LS joint and its relationship to the point of hip. Look at their backs and guess their lengths, then measure to see how close you were with your estimations. Look at their withers, are they prominent and drop off abruptly, or are they lower and flow smoothly into the back, or some combination.